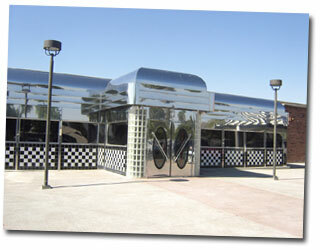 Dinermite Diners, Modular Stainless Steel Diners for Sale. Seat 30 to 160 customers in our modular 1950s style diners. 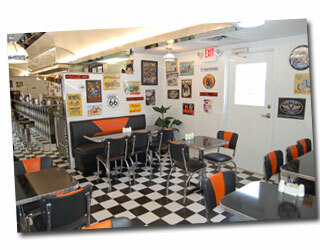 Modular Diners became famous in the 50's and are still one of the most popular restaurants in the Country. Modular Diner sales to Canada, Mexico, Panama, England, United Kingdom, UK, Germany, Italy, France, Greece, Japan, Hong Kong, China, Australia, Taiwan, South Korea, Sweden, Switzerland, Russia, Poland, Australia, New Zealand, Belize, Ireland, Netherlands, Spain,Belgium, Ecuador, Phillippines, etc..
Dinermite Diners offers many modular designs and options that can easily fit into your diner or restaurant budget. View our Modular DINER INSTALLATION page to see how we ship and set up your NEW stainless steel diner. Click here to view diner installation Gallery. We manufacture the following modular diners; Silver Star Diner, Silver Eagle Diner, Silver Eagle Star Diner, Silver Eagle Junior Diner, Dinermite Classic Diner, Classic 120 seat Diner, Classic 140 seat Diner, Classic 160 seat Diner, and any custom diner or restaurant required by the client.